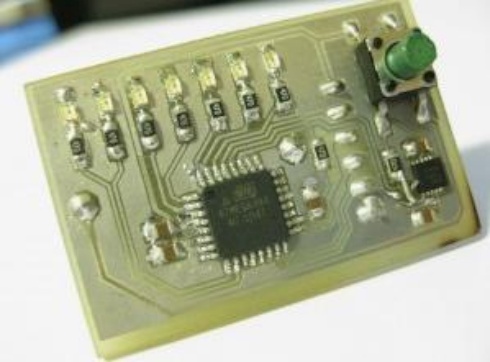 uPOV is a persistence of vision device with an accelerometer. This is the same concept we’re trying for with the USB POV Toy. The problem I had with most of the current POV units is that they required skill to use effectively, timing your swings so that the message only goes in the one direction, appears in approximately the same spot, etc… So I decided to use an accelerometer in my design! This entry was posted on Thursday, April 28th, 2011 at 10:56 am	and is filed under AVR, POV Toy. You can follow any responses to this entry through the RSS 2.0 feed. You can skip to the end and leave a response. Pinging is currently not allowed. I have seen this few days ago, it has to be said that this project is really awesome!